Check out our YouTube Channel to see examples of TS Carriage Systems in action. 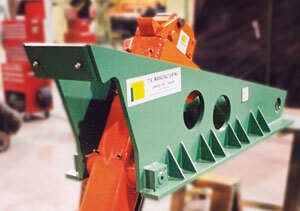 A linear carriage must be precise, durable, and reliable. TS Manufacturing's Linear Carriages are built with these concepts in mind. Whether it is our reliable Boardmaster series of carriages, or our state of the art, patented, Accu-Chrome series – precision, durability and reliability come standard. 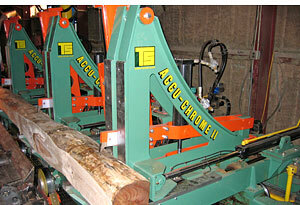 Our patented Accu-Chrome family of carriages have been in trouble free operation since 1988. This revolutionary design offers reduced maintenance, increased precision and lower cost of ownership in comparison with conventional carriages. In 2003, we introduced our revolutionary Accu-Chrome Generation 2 Series Carriage, offering narrower faces for better taper control without dog pull out. The TS Accu-Chrome Carriage uses 360 degree solid roundway bunk supports, providing the knee with excellent precision that is not susceptible to the wear variances of Gibb designs. The entire carriage knee, including the dogging system, is mounted to these precision machined roundways, allowing for greater wear surface and longer durations between maintenance than Gibb designs. The result is a more precise carriage - necessary for modern optimization. This also allows all wear plates to be replaced without removing the bunk. 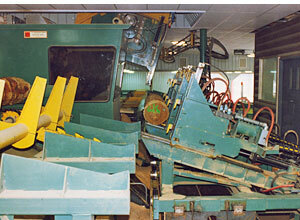 Our Boardmaster Carriages have been in operation for over 30 years. From the simple automatic to the fully equipped, linear positioning slant, TS Carriages are synonymous with quality and commitment to service. 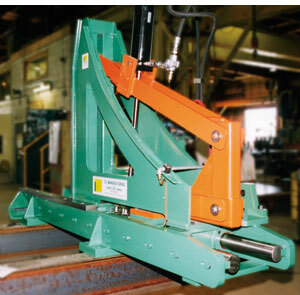 Our Boardmaster Carriages are available in hydraulic linear positioning or electric positioning; in flat or slant configurations, with either board or tong dogging styles. The Boardmaster family comes standard in 36", 42", and 48" sizes with a variety of accessories available. Our present Boardmaster Series of carriages are available in either hydraulic linear positioning, or electric positioning; in flat or slant configurations, and with either board or Tong Dogging styles. The Boardmaster family comes standard in 36", 42", and 48" sizes with a variety of available accessories. TS Carriage Systems are available with a wide array of optional accessories. 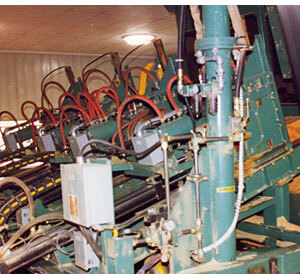 Our 30+ years of experience designing, manufacturing and installing carriages allows us to offer every conceivable option from Carriage Drives (electric or hydraulic) to log turners and on-carriage log handling systems for increased productivity. TS Accu-Chrome Carriage accessories are low maintenance. 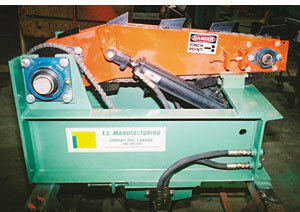 We utilize designs that eliminate conventional wear strips and lubrication requirements.